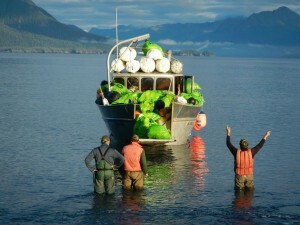 A few years ago I got interested in a group that was cleaning up marine debris from beaches in Prince William Sound. I volunteered, and I was blown away by what a rewarding experience it was to pick up trash. I’ve spent plenty of time in the wilderness, but this was unique, because I felt like I was improving the place, the kind of place that normally is way too good to ever be improved by human hands. Unfortunately, garbage is everywhere, especially in our waterways. But you can make a difference. When you help get rid of it, you feel like you are re-creating something magnificent. On today’s show, we’re talking about beach cleanup, both on the wild, outer coast where stuff is washing up from Japan, and on our beaches here in Anchorage. And we’ll talk about creek cleanup too, which is coming up shortly, and where we get to tend to our own back yard.